In this month’s Tips from the Top, we offer you news on the Panda 4.0 algorithm update plus social media tips, changes and research. These changes bring great value to the digital marketing world by integrating SEO optimization for search visibility. Read more about these updates, changes, tips and research in the top online marketing news below. This is a new Panda algorithm, not a refresh that we’ve seen almost monthly but enough for Google to name this 4.0, which means a new algorithm update to it. Google’s Matt Cutts told us at Search Engine Land that this Panda 4.0 update impacts ~7.5% of English queries to a degree that a regular user might notice. Pinterest is finally setting out to make some money. The social-bookmarking company catapulted to renown from total obscurity among marketers and publishers in late 2011, when its user base and the traffic it delivered began to spike. It’s raised $564 million since it was founded in 2010, but has taken a leisurely approach to building a business. Did you know that there are well over 1,000 social media software tools to choose from to help you manage your social media presence? We come across great tools on a regular basis. One of my favorite recent ones is OptinMonster which is a WordPress plugin that helps build email subscribers. I switched it off a couple of weeks ago and seen a massive drop in subscribers. It’s awesome. Within the next five years, U.S. social advertising revenues will reach $15 billion, with native and mobile leading the way. Driven by the growth of mobile and native advertising, U.S. social media advertising revenues will increase from $5.1 billion in 2013 to $15 billion in 2018, according to BIA/Kelsey. Most of us create and share content on social media with the hope of getting a reaction. That Facebook post telling your friends about a great new restaurant down the street or that tweet about the score to tonight’s game, both have the same intention: strike a chord with your unique set of friends and followers. But how do you know your restaurant review will be helpful to your Facebook friends or that your Twitter followers will even care about the score of the game? The latest post on the Pinterest blog takes a close look at what the post popular categories are for each day of the week. So, what kinds of things are people pinning on Monday through Sunday? Your audience is bombarded with more content than they can consume (Mark Schaefer calls it content shock). That information overload is blocking your visibility and marketing efforts. You may be creating compelling content with blog posts, infographics, images or videos, but that content is limited by the walls of social media channels and your existing readers. The thunder clap of Google’s Matt Cutts’s Twitter post could be heard across the web this week with the announcement of the search engine’s latest update, Panda 4.0. Of course the type of Panda I’m talking about isn’t a cute bear from China. It’s the name of an algorithm used by Google to filter out low quality content from search results. There are many content types and tactics for content marketing. Each has its place. Each offers unique benefits. Creating original content on an ongoing basis can be a challenge, so most marketers practice the fine art of content repurposing. Mike Stelzner over at Social Media Examiner has published the 6th Annual Social Media Marketing Industry Report based on a survey of over 2,800 marketers. It’s a pretty robust report at 50 pages and covers the gamut of social media marketing topics from the most important social platforms for marketing to the most important social content types to the ways marketers will be changing their approach to social media in the future. Top 50 People Most ReTweeted by Digital Marketers – What Does It Mean? When identifying influencers as part of your social media and content marketing program, topic match and popularity are not enough to qualify an influencer as “effective.” By effective, I mean the ability and likelihood that a person can actually inspire action amongst a community. There are many types of content a business can create to attract, engage and convert customers: Evergreen, Repurposed, Curated and Co-Created. Of those content types, curated content offers numerous benefits that many companies are not taking advantage of. While content curation has grown in popularity since we first started writing about it in 2010, the question remains: Does it belong in your digital marketing mix? Fusion Marketing Experience: Serving the customer AND the brand: Lee Odden connects the dots – Lee is back with some clear messages and a model for winning with a customer-centric content marketing strategy that steers away from your eternal best practices. 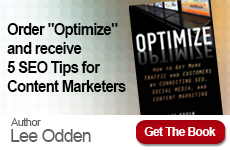 Komfo: Interview with Lee Odden: How to Make Social Media an Integrated Part of Online Marketing – TopRank’s CEO offers insights and tips on how to integrate social media with other online marketing channels and how to improve the customer journey. 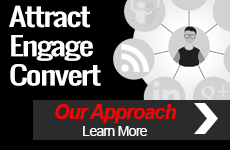 Tech Guru Daily: Attract Customers Not Search Engines – This blog segment depicts how TopRank understands SEO and how to implement it properly in written content by not only focusing on the search engines, but also making it personable to the audience. MC Student Blog: INTEGRATE2014 Recap: Lee – After Lee Odden’s Digital Convergence: The Integrated Marketing & PR Imperative session, MC Student Blog focused on Lee’s discussion of changing the game of content marketing in terms of optimization. LinkedIn: 10 B2B Masters Reveal Storytelling Secrets – In this eBook compilation of content marketing strategies, Lee Oden discusses ways to create content that stand out and inspire action by tapping into the human element. “That was a top-level conference in Denver that sets the bar really high! Lee, you made a great presentation and I have been preaching your “be the best answer” concept. Thanks!” – Doug Francis, from What Makes a Business and Marketing Conference Great?